You may have heard about the drought, famine and mass exodus of refugees in the Horn of Africa, but haven’t quite grasped what is important to know about the crisis or how you can help. Here is a quick summary if you are new to the situation. 1. The geography: The Horn of Africa is the region that includes the countries of Somalia, Ethiopia, Eritrea, and Djibouti. Kenya has been greatly affected by the drought as well and is considered part of East Africa. 2. The drought: Over the past two years, rainfall levels have been extremely low resulting in crops failing and cattle dying throughout the region. The droughts effect is devastating and in Somalia, political issues have hindered relief efforts as well. 3. The UN: The World Food Programme (WFP) is the United Nations’ branch for fighting hunger. It is the largest humanitarian organization in the world dedicated to solving hunger issues. The WFP’s Food Security Assessment Unit has declared a “famine” in five areas of Somalia. This designation is based on three criteria: the number of people dying from hunger (2 for every 10,000 population per day), at least 20 percent of the population has extremely limited access to basic food and 30% of the population shows signs of malnutrition. 4. The civil war in Somalia: Hindering the relief efforts in Somalia is a long standing civil war. Al-Shabaab is a militant Islamic force trying to gain control of the country. They have taken over large parts of Southern and Central Somalia, as well as parts of the capital city, Mogadishu. They consider themselves waging jihad on the “enemies of Islam” and where they have won control they have enforced Sharia law. They distrust all humanitarian organizations and have killed 14 aid workers from the WFP since 2008. The war has made relief efforts difficult in central Somalia and impossible in Southern areas of the country. 5. The refugees and refugee camps: Because of the famine and civil war thousands of Somalis have taken refuge by walking to neighboring countries. It is estimated that 300 refugees arrive in Ethiopia per day and 1300 walk to refugee camps in Kenya each day. In Kenya, 25% of the new arrivals are malnourished children. Refugee camps near Dadaab in Kenya and Dollo Ado in Ethiopia are receiving the most refugees and world-wide attention. 6. 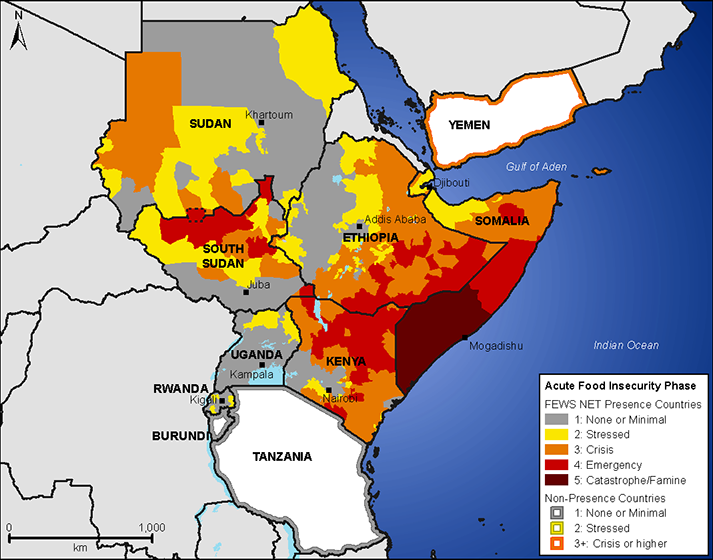 The surrounding countries: While not receiving the designation of experiencing a “famine”, the situations in Kenya and Ethiopia are comparably desperate. In Kenya, an estimated 1.2 million people are at the “emergency” level (one step away from the “famine” designation) and are unable to meet basic needs. Another two million Kenyans, mostly cattle and agricultural farmers, are in crisis. In Ethiopia, the south and southeastern parts of the country faced two consecutive seasons of very poor rains. The drought is said to be the worst since 1950 and it is estimated that 4.8 million Ethiopians are in need of assistance. 7. The churches: For me, the leader of an organization dedicated to helping indigenous churches minister to the extreme poor, it is important to know what churches are doing during a crisis situation. Here is a brief overview of the evangelical church in these countries. Somalia: The church was forced underground in 1991 when the government was overturned by rebels. Somali Christians continue to be persecuted and even martyred. Most Christians have fled the country or meet in secret. This fact makes estimating the number of Christians difficult but some would estimate the number of Christian believers at around 4000. Finn Church Aid is the only known Christian organization currently doing relief efforts in Somalia. Ethiopia: North Ethiopia was one of the first Christian nations, back in the 4th century. However a Marxist regime took power in 1974 and began persecuting Christians and destroying churches until it was overthrown in 1991. Today the number of evangelical Christians in Ethiopia has grown to over 20% of the population. Several Christian agencies are currently working in Ethiopia including SIM and Christian Aid (UK based). Kenya: Kenya has a large percentage of nominal Christians, nearly 50% of the population. However, only 7% attend church, thus few Christians are devoted or discipled. There are many relief and development agencies in Kenya because of its stable government and central location. Below are a few Christian agencies involved in helping the relief situation from Kenya. This is not an exhaustive list, so please feel free to add the names and websites of other accredited agencies in the comments section. I would like to share this information with our pastors and leaders in Oasis Ministerial Fellowship, we have ministers in Kenya who have written requesting spiritual and financial support. This article is well written and document. However I don’t see a pdf. file or link in which I can add this to the Oasis World Wide News Publication website for our readers. I would appreciate your assistance and thank you for this update. Thank you so much for this very important information. It is very important to note that dispite being blessed with abundant resources, many of these resources remain untapped our under utilised coupled with poor management.The other greated resource Africa is blessed with the wanderful human resource which when properly managed could transform the whole continent. Our request is that our friends who have so much opportunities to partner with churches in empowering the locals so that they can manage themselves in the long run. Whatever you do will go a long way to change the lives of many people who hardly have a meal a day. We thank you in advance. Thank you for your inspiring words. I too believe in empowering the local church. We are part of one body, the Scriptures tell us, and we must act accordingly. When the church stops trying to lead each other and begins to serve each other we shall see more people won to Christ, helped out of poverty and empowered to change our communities than history has known. Thanks alot for your elaborate information about drought and famine in horn of Africa . Kenya has alot of refugees . There is urgent need for help here in Kenya thanks alot God bless you. Thanks Bishop for your comments. You and your country are in our prayers.